I now have one boy in this age range, but the other two have been there. This, to me, is the easiest age to buy for – cars, LEGOs, board games, electronic games, clothes, shoes, and the list of holiday gift ideas for young boys goes on and on! These fun items are perfect for little boys this Christmas! The Original AJ’s Toy Snow Boarders is a simple toy that let’s kids use their imagination. 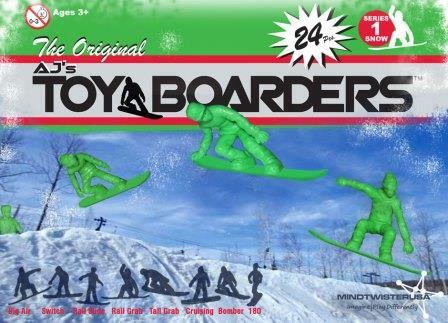 These are made just like the toy soldiers that have been around for decades but why promote war to kids when you now can promote a positive image of fun and exercise with these authentic snowboarders that are hand designed and molded with remarkable attention to detail and style. Any kid can enjoy AJ’s Snow Boarders. They can make a snow park out of anything around the house, take them wherever they go and use their imagination for hours of enjoyment. Remember Army Men? My brother and I had hours of fun with those little green men. We would build forts and stuff with Lincoln Logs or LEGO blocks and just pretend. These Snow Boarders are the exact same concept and can provide hours of imagination fun! Kids are always on the “go” and it shows when they speed through the important act of brushing teeth. But the “rush hour” rued by dentists everywhere is about to be a thing of the past, courtesy of Dr. Fresh LLC. Firefly®, the only oral care brand focused solely on kids and maker of the number one selling FireFly® kids light-up timer toothbrush – has introduced the new FireFly Ready Go Brush™. This novel toothbrush is a fun and motivational tool that “times” kids to make sure they brush the dentist-recommended 60 seconds per arch. It has a flashing light that changes from green for “go” to yellow for “halfway there” to red for “finished.” As a bonus, the brush has a suction cup holder that allows it to be stored upright and hygienically, making sure it does not collide with other toothbrushes or germs on the bathroom counter. The toothbrush is a fun and colorful presence at the sink as well as a teaching tool that helps kids develop a healthy routine. Fledgling brushers will be entertained by the colorful green-yellow-red flashing “stoplight” motif, which is easily activated at the touch of a button. Parents will love the reduction in counter clutter offered by the suction cup handle, not to mention not having to nag kids to brush their teeth. The brush features soft, high quality Dupont Tynex bristles that are effective yet gentle on delicate young gums, and a child-friendly ergonomic design. Kids can choose among Barbie™*, Angry Birds, Marvel’s Spider- Man or FireFly Ready Go toothbrushes.